← Forget All That Human Rights Stuff; Cuba’s Open for Bidness! ‘But wait a little while, then watch the next IML loan terms’, he predicts. He also sees the likelihood that Macri will try to re-privatize SS, a past epic failure that the Kircheners reversed. “Washington, D.C. – A leaked diplomatic cable from the U.S. Embassy in Argentina states that current presidential candidate Mauricio Macri accused U.S. officials of being “too soft” on the government of Argentina. As we know, even when ‘Democracy’ NGOs are chased out of a nation, new ones pop up like weeds to fund right-wing candidates and their missions. 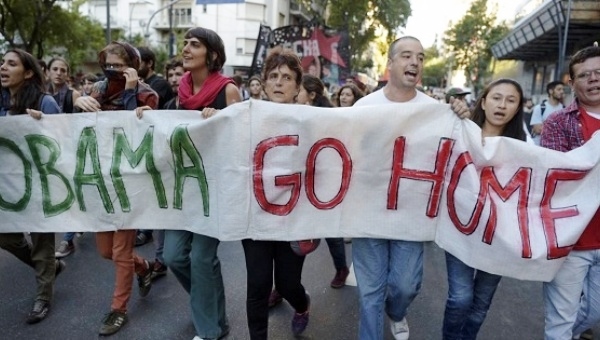 “Along with its pro-business policies, the Macri government has begun to unveil a number of austerity measures, including drastic cuts to education and health care, and a whopping 300 percent increase in electricity prices (previously subsidized under the Kirchner government) effective last month. His paragraphs on Macri & Co’s policies on permitted dissent are chilling, and all too familiar.